This 3 sauce, Chinese Noodles recipe is a staple at my house. It’s probably one of the easiest Chinese stir-fry recipes, as it’s done EASY and can be made in as fast as 20 minutes! You don’t even have to buy specific “Chinese noodles” for these. Use spaghetti or linguine (which is what I used here), with delicious results! I like to over cook the pasta by a few minutes for a fluffier (lo-mein) kinda texture and it works great! I have made this recipe countless of times and my mother-in-law has even been making it as a rotation at her house (yep, it’s a keeper!) It was shared by Liliya after she had us over as guests one day and since then I discovered this super easy RECIPE! 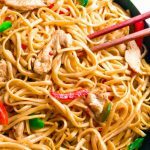 A must try for tasty Asian flavored noodles done fast! 1. Cook pasta in boiling water for 16 minutes, uncovered and stirring occasionally. 2. Meanwhile, sauté the chicken and peppers until meat is cooked through. Add in the sauce ingredients and toss to coat. Cook pasta in boiling water for 16 minutes, uncovered and stirring occasionally. Meanwhile, sauté the chicken and peppers until meat is cooked through. Add in the sauce ingredients and toss to coat.